Derek was Irish Formula Ford champ-ion in 1975, Formula Ford Festival winner in 1976 and won the BP British Formula Three crown in 1977. He kicked off his Formula One career with the Hesketh team in 1978 by leading until spinning off in a very wet International Trophy race at Silverstone. His form in the World Championship was not so good, as he failed to qualify on all three outings. Crossing to Ensign was an improvement, and he scored a point before the year was out. A move to Tyrrell halfway through 1979 preceded a full season with Tyrrell in 1980 and his most spectacular shunt of all on the opening lap of the Monaco Grand Prix when he became airborne and landed right on his team-mate, Jean-Pierre Jarier. His ride with March did not yield a point in 1981. A ride with Theodore in 1982 looked equally dire, but Carlos Reutemann quit suddenly and Derek was asked to take his place at Williams alongside Keke Rosberg. The Finn went on to win the title, while the Irishman never made it to the podium and quit Formula One for Indy Cars. 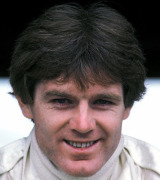 Despite a leg-smashing shunt in 1984, Derek went on racing in Indy Cars and then sports cars until 1992, and has since become a respected television commentator Stateside.